This was disclosed with the recent release of phone conversations from early 2011 between Muammar Gaddafi and former British Prime Minister Tony Blair. Gaddafi’s warning went unheeded, and NATO, led by the U.S. and France, launched an air war that toppled Libya’s government. Later that year, Gaddafi (himself a brutal oppressor, like all heads of state) was forced out of a drainage pipe, and then beaten, sodomized, and shot in the street by a mob. His corpse was then draped over the hood of a car. Since then, Gaddafi has been proven tragically right. As Libya descended into civil war and failed-state chaos, jihadi groups connected to Al Qaeda conquered much of the country. Libya underwent the same American “liberation” that had already befallen Afghanistan, Iraq, and Somalia — and would soon be visited on Syria and Yemen. Shortly after Gaddafi’s overthrow, some of the now-rampant jihadis helped the CIA run guns from Benghazi to fellow jihadis in Syria. After the regime change, on September 11, 2012, the jihadis turned on their U.S. allies in Benghazi, sacked the U.S. diplomatic compound, and murdered Ambassador Chris Stevens. Now ISIS has spread throughout Libya. Just days ago, ISIS perpetrated a truck bombing that killed dozens at a Libyan police academy in Sirte, a former Gaddafi stronghold. Indeed, Gaddafi informed Blair that jihadis had “attacked police stations” back in 2011. And ISIS has, indeed, been battling to take control of Libya’s main oil ports in recent weeks. The group has also long been planning to use Libya as a base from which to launch attacks on nearby southern Europe. ISIS did strike Europe recently, most famously in Paris. And it was not just Gaddafi personally who had been ringing such alarms to the Western powers thirsting for his blood. His intelligence officers produced reports demonstrating that heavy weapons being sent to the Libyan opposition, with NATO approval and Qatari financing, were being funneled to militants with ties to Al Qaeda. At least one of those reports was even prepared in English to facilitate its transmission to key members of Congress via U.S. intelligence. They would soon be joined by U.S. special forces and the CIA. The war in Libya that Hillary Clinton, U.N. Ambassador Susan Rice, and Samantha Power of the National Security Council were driving toward was so predictably a fiasco-to-come that, behind the backs of the Amazon Warriors Three, America’s top generals conspired with leftie peacenik Congressman Dennis Kucinich to try to arrange a peaceful resolution to the crisis. But the war-making diplomats triumphed over the diplomacy-making soldiers. Hillary buffaloed the brass and got her war. “In the months leading up to the [2012 Benghazi] attack, flags belonging to a jihadist group, Ansar al Sharia, appeared in Benghazi. Ansar al Sharia members also controlled security around certain government buildings, including the hospital that would try to save Stevens. Conservative politicos have long strained to use Benghazi to torpedo Hillary’s bid for the presidency. But their efforts are crippled by their own fundamental agreement with Hillary’s militarism. They support the general policy of employing jihadis to overthrow secular dictators (not only in Libya, but Syria too). So they limit themselves to whining about Hillary’s security measures. The true Benghazi scandal indicts not just Hillary, but the entire Western power elite, whose wars have, as Gaddafi warned, flooded the world with a Jihadi Deluge and installed a postdiluvian Reign of Terror over us all. Moscow continues the military reinforcement of the Russian Kuril Islands as well as the de facto annexation of the occupied Japanese islands Iturup, Kunashir, Shikotan and the Habomai Archipelago under the guise of cultural and economic development of what Russia describes as its “South Kuril Islands”. Russia is, along with the United States, Canada, Norway and others scrambling for resources in the Arctic as a warmer climate has made both shipping routes and resources in the region accessible. Russia has, as have others, legal territorial claims in the increasingly attractive, although harsh Arcticregion. Moscow’s “cultural development” of what Russian diplomats like to designate as Russia’s “South Kuril Islands“ is, however, legally questionable and disputed by Japan. The so-called South Kuril Islands consist of three islands located in the North of Japan, or the southwestern extremity of the Kuril Islands, as Moscow designated the disputed territory. They include the islands of Kunashir, Iturup,Shikotan as well as the Habomai archipelago. It is noteworthy that Russia, 70 years after the end of WW II still has not signed a peace treaty with Japan and that Moscow continues dragging its feet in that regard. Several independent analysts noted that Moscow uses the prospect of a peace treaty – or lack thereof – to blackmail Japan rather than settling the dispute legally and in accordance with intentional and human rights law. Japan does not recognize the Russian occupation or annexation of what Tokyo describes as Japan’s northern territories. Tokyo considers Moscow’s so-called program for social and economic development as an attempt to change the demographics and to lay the foundations for a permanent,arguably illegal annexation. The following is a letter written to the CBC ombdusman by an informed member of the public in Canada, enraged by the blatant anti-Syrian stance in the CBC reporting of the Madaya “starvation” situation. I have counted The Current and CBC news as among the most reliable sources of news and information we have. I consider myself an informed listener and I consult with many and diverse news sources to get the fullest and clearest understanding of world affairs possible. That’s why it is disappointing, and sometimes infuriating when I hear the CBC reduced to an echo chamber and propaganda conveyance when it comes to news from the Middle East. The CBC’s use of unreliable and unverified sources and information that presents and thus promotes only one side of events, and a distorted one at that, is shocking to me. Is it due to cutbacks that you are unable to have investigative reporting from conflict areas that reports on all sides of an event, or is there something more sinister going on exercising editorial control over what Canadians are allowed to hear from the Middle East via our national broadcaster? Specifically, I was very upset to hear The Current’s Jan 8th report with Lyse Doucet on the situation in Madaya, Syria that gave a completely distorted and misinformed picture of the siege of this town (and several others that are getting zero news coverage). The presenter relied on only one source, a citizen journalist named Rami Jarrah who works for the George Soros funded ANA Press, and is a self-avowed advocate and spokesperson for the terrorist factions, disingenuously called “the opposition” by uncritical media, that has the town of Madaya and several others in the West and North of Syria under militant siege. It is these Islamist militants–Ahrar al Sham and al Qaeda– that seized the food aid delivered by the ICRC last October–meant to last for 2 months–and is keeping the towns people on starvation rations, stockpiling the food then trying to sell it to the towns people for obscene prices. Why isn’t that being reported on? It is the militants that are refusing to let the townspeople leave to find refuge in safe zones. It is these militants who are starving and killing them. 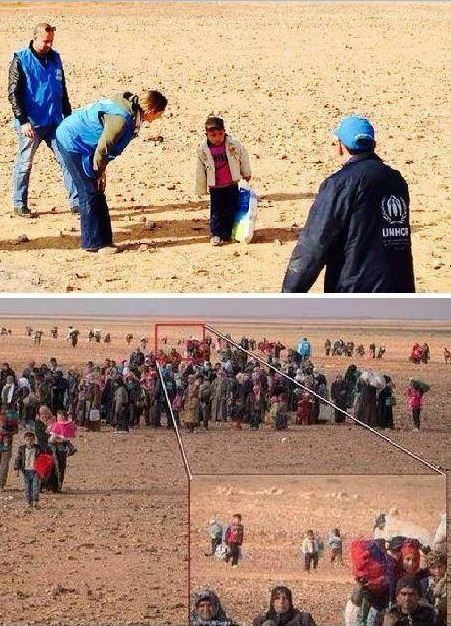 These Islamist militants, “the opposition” as propagandists call them, are using the starving people under their control to deceive the world, including the use of now exposed deceptive pictures of starving people stolen from the internet to foment outrage–pictures that are uncritically and irresponsibly used by media outlets like the CBC as some kind of “proof” that the Assad regime is responsible for this suffering. While these areas of conflict are surrounded by government forces, it is the terrorists occupying the villages that are not surrendering and continue to use people as human shields ad for propaganda. Did The Current or is the CBC news desk presenting any of this balance at all to your stories on Syria? No. You are being played, and worse are a willing participant in a one-sided, anti-Syrian government, pro-Syria destruction campaign. These are the questions you should be asking. The answer is because Jarrah and these “humanitarian interventionists” are using and abusing these civilians to enlist more western involvement. You are not listening to any of the voices coming from inside Syria because you seem to value those minority voices outside Syria that are vying for overthrow of the government and seek to grasp power for themselves in lockstep with western hegemonic agendas. Thus you are not doing your job. What you are promoting, maybe inadvertently, maybe not, is for Syria to be devastated by NATO the way Iraq and Libya were, and not for the human rights of the people of Syria. This is despicable and my respect for the CBC has diminished significantly. I urge the CBC to return to it’s roots of unbiased investigative journalism and be committed to the truth so that I can feel confidence again to tune into CBC news and trust we are getting the best information. Balance your blatantly biased sources with “the other side”– the Syrian government that is backed by the vast majority of Syrian people, and the Syrian doctors and activists that are actually working to free their country from the terrorists!! Listen to the Syrians INSIDE SYRIA! The text above originally appeared at The Wall Will Fall. NOTE: Just last week, the CBC appeared to be leading the propaganda effort, with stories of famine in Madaya, with media operatives from the World Food Program (WFP) providing ‘neutral’ reporting – subtly spun and placing blame on the Syrian government and allied Hezbollah militia – as being responsible for the “blockade in humanitarian aid” to the residents of Madaya. 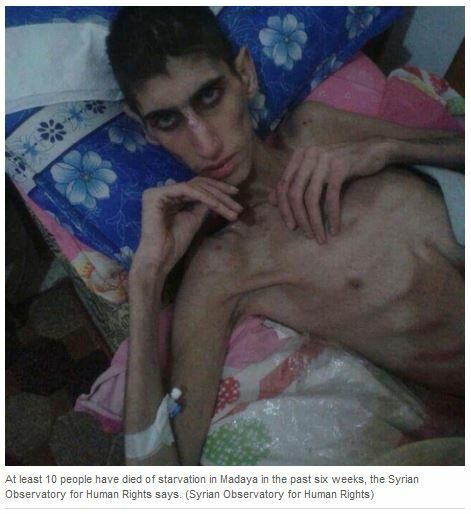 No real verification or citation of this image of the starving man was provided by the CBC or the SOHR, so we can assume then that this photo was one of many fakes which have also appeared in a number of western mainstream media outlets, and all promoting the same familiar westernpro-war and pro-regime change propaganda lines. Yet more proof of how leading media organisations are engaged in outright deception and fraud when it comes to their ‘news’ coverage in conflict zone coveted by western governments.